Be the first to share your favorite memory, photo or story of Armella. This memorial page is dedicated for family, friends and future generations to celebrate the life of their loved one. 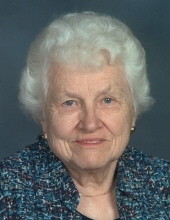 Armella B. Arpke, age 90, of Plymouth, passed away peacefully on Friday (March 22, 2019) at Songbird Pond f/k/a Anita’s Gardens with her daughters at her side. She was born on February 6, 1929 in the Town of Rhine, a daughter to the late Edgar and Elva (Mahlich) Zimmermann. Armella graduated from Elkhart High School in 1947. On September 15, 1948, she married Jerome “Romy” Arpke. Romy preceded her in death on November 2, 1980. She worked at Ebenreiter Lumber Company until 1950. Armella became a full time homemaker and raised her family until returning to the workforce in 1979 at Stroub Pharmacy in Sheboygan Falls until retirement in 1994. Armella was a member of St. Peter Evangelical Church in the Town of Rhine. She enjoyed playing cards, gardening, doing jigsaw puzzles, taking trips and vacationing with her friends and family. Her greatest joy was spending time with her family and she loved being a grandmother to Nicole and Samantha. Survivors include her daughters, Darlene Janquart of Plymouth and Diane (Jeff) Ponath of Plymouth; granddaughters, Nicole (Kevin) Ponath of Chicago and Samantha (Peter) Ponath of Fitchburg, WI; step-grandson, David (Kelly) Janquart of Prairie di Dac, WI; and sister-in-law: Bernice Dora of Howards Grove. She is preceded in death by her husband, Jerome; son, Dale; son-in-law, Tim Janquart; step-grandson, Daniel Janquart; infant sister, Ardella; sisters-in-law and brothers-in-law, Wesley (Gertrude) Arpke, Herbert (Hazel) Wickesberg, Alfred (Marie) Lorenz, Richard (Donna) Arpke, Edwin Dora; nephew, Charles Wickesberg; niece, Barbara Arpke; and goddaughter, JoAnn Ernest. Visitation with the family will take place on Tuesday evening (March 26, 2019) from 5:00 P.M. – 6:30 P.M. at the Suchon Funeral Home in Plymouth. Following Armella’s wishes, private family services will follow. Rev. Ted McCurdy, Pastor of St. Peter Evangelical Church will officiate. Burial will at the St. Peter Evangelical Cemetery. In lieu of flowers, a memorial fund is being established in Armella’s name. The Suchon Funeral Home is assisting the family. For online condolences, please visit www.suchonfh.com. The family would like to send a special thanks to the staff at Songbird Pond and the team at Encompass Hospice Care for all the care and compassion given to Armella. To send flowers or a remembrance gift to the family of Armella B. Arpke, please visit our Tribute Store. "Email Address" would like to share the life celebration of Armella B. Arpke. Click on the "link" to go to share a favorite memory or leave a condolence message for the family.